1. The Ancient Flame; 2. The Devil You Know; 3. Lady and the Painter; 4. Zero Hour. It had an interesting story that combined Murder with the Paranormal, and was definitely for Adults Only due to the graphic nature of the murders and the accompanying violence, which fortunately was more matter of fact than dragged out too long. This was refreshing in this HOPA genre of games, and I thought almost on a par with the much missed, wonderful, CSI (computer) Series. It was a fast moving, highly interactive game, in which you had to actually do all the actions as they occurred. This did slow the game a little but that was fine because it was due to Player Participation. The characters portrayed were believable both visually and via their voice actors, and divided easily into those I liked and those I didn’t. I really disliked his annoying, misguided sister, Allie, throughout most of the game, and I reserve my judgement about her even after completion – see what you think. The game became rather tense at times, the sense of urgency was always apparent. I really liked it. Upon completion of the Survey I earmarked it immediately for purchase, then waited a rather long time for it to be issued. When it finally came out, I purchased it, then began to play it from the start again. I thought it was a bit odd that the title was now ADAM WOLFE: FLAMES OF TIME, and that on the PLAY Menu there only appeared to be 1. 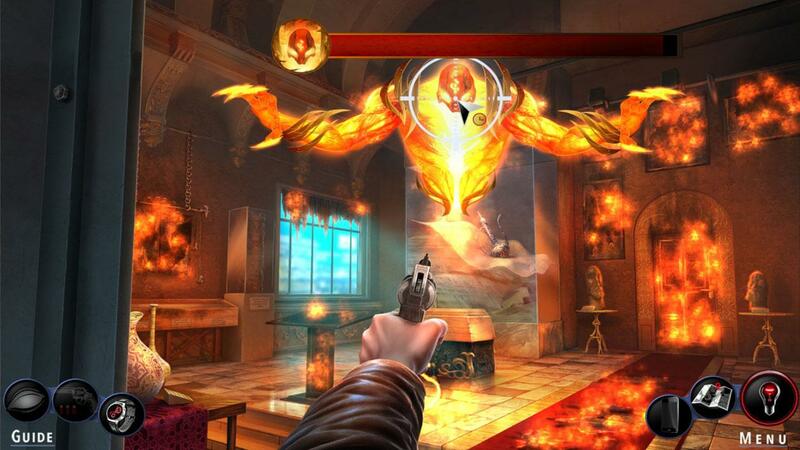 The Ancient Flame as the main game, and the locked game 2. The Devil You Know. Where were the other two chapters? Options & Main Menu: Both very good, well set out. Extras: There were none as it is a Standard game. The Game-Play didn’t miss them, but it would be nice to have the HOPs to revisit at the end of the game, or if you just want to visit it without playing it right through. Music & Voice-Overs: I’ve already said how good the Voice-Overs were; and the Music was excellent. I kept mine turned down low as I always do, as I don’t need the stress that adds to the game’s growing tension. Tutorial: Excellent, efficient, not too intrusive – can be opted out of at any time. Graphics: As with most MAD HEAD games, these are delicious, grungy sometimes, really colourful at others, atmospheric where necessary (though a little too much in the HOPs), imaginative, detailing the characters and their environments into reality. I was immersed almost at once into their worlds. Play Modes: Easy, Medium, Hard, Custom – I use the last one wherever it’s offered. And the more choices offered the better. Map: This was good, interactive, with the usual Key to its function options. HOPs: My only problem with these were that there weren’t heaps of them, though I believe I revisited some. There were Progressive Lists, Interactive Lists and Silhouettes, Riddles/Storylines with individual WORDS highlighted that you need to find. 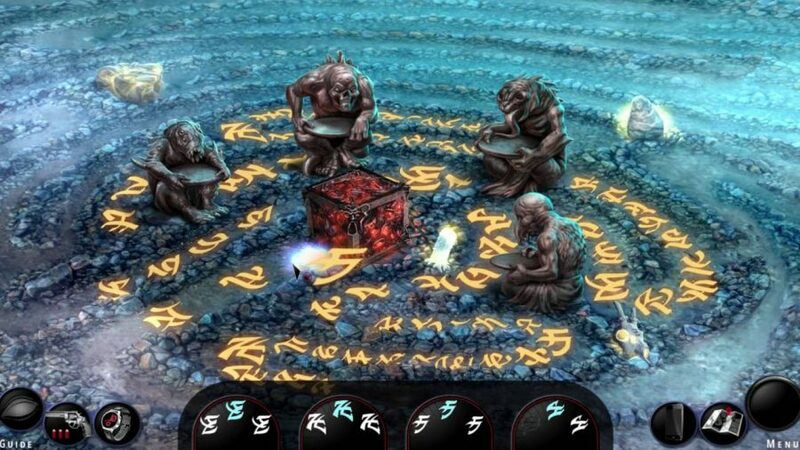 Puzzles/Mini-Games: These were scattered throughout the game, requiring solving in order to collect or open or unlock or dismantle or repair or combine something. Game-play: This progressed logically, keeping you moving forward, compelling yet disturbing at times. The mechanics of the game-play were okay, a little skittish at times with the mouse action, but that could be my PC and not generally. It would be interesting to get feedback about that. And of course it was the usual B&F, P&C (Back & Forth, Point & Click) which the Map helped to alleviate by allowing you to jump from site to site. Interestingly, this actually adds to the sense of urgency, rather than interfere with the sense of the game by not passing back and forth through the various chambers to get from one site to the other. So after a while ADAM WOLFE: BLOOD OF ETERNITY was released, in which 3. Lady and the Painter, and 4. Zero Hour were to be found. Instead of making it a Crime game with 4 Cases, it became a Series of 2 Games with 2 Cases each. Financially more lucrative. If they’d added HOPs as an Extra at the end they could have called it a Collector’s Edition and charged twice as much. Or they could have been generous to the Players giving them what the SURVEY promised. Naturally I earmarked the second Adam Wolfe game for purchase, as I needed to find out how the story ended – though it’s always expected that the protagonist would be successful. Story: Following his previous two cases, Adam begins to unravel a new mystery. This time, Adam comes to the aid of a painter that is besieged by a ghost. In his investigation, he learns more about the same cult and that it might be somehow connected to his missing sister. Through mortal danger, he reunites the painter with his departed wife but also attains a solid lead about his sister. All the parameters from the first game applied to the second game. Of course. It was a continuation of the Main Story of rescuing his sister. The complexity of doing so had increased hugely as you can see by the above storyline, but the game-play actions remained the same. It was engrossing, scary, thrilling, annoying, frustrating, and very tense. The merging of the Crime elements with the Paranormal was masterful. There was more violence, paranormal characters and activity, progressively carrying you forward towards the culmination. As you would expect, the anticipation levels rose the closer you got to the end. Frustration Factors: Then it was over. Just that. The ending was unsatisfactory, ambiguous. There was absolutely not enough of the culmination shown, you didn’t participate in the culmination as a Player. It was done, dusted, packed away. If you blinked you missed it. I was so annoyed. I was disappointed by, let down by, and completely pissed off at the game producers. If you are creating a story-based game, then, like a novel, you should allow your audience to see it through properly to the end. So many games drop the Player at the end, saying the characters were saved/were happy together/saved the world/found the missing relative or item etc, THE END. That is not right or fair to the Player, who the producers have asked/relied upon to become involved in the story of their game. That is where this great game is let down. It doesn’t live up to the CSI Series, whose Producers got it so right – if only they would do so again for PC. Satisfaction Factor: So bearing in mind all that I have have just said – this is a really good Crime game. It is all it should be as you play through it. It leaves you wanting more, each time you finish a Chapter/Case. You can’t wait to get back to do the next one. But it falls flat at the end. If you only care about the Game-Play, then you will love this game! If the satisfaction of the Culmination doesn’t bother you, you will have a great time. Go for it! In fact to all Crime/Paranormal fans I say “Go for it!” Just be prepared for the end. Of course, it is highly likely that there will be another ADAM WOLFE – PARANORMAL DETECTIVE GAME to follow. I could suggest that that is the excuse for the shut down ending. It may be a reason, but it’s no excuse. 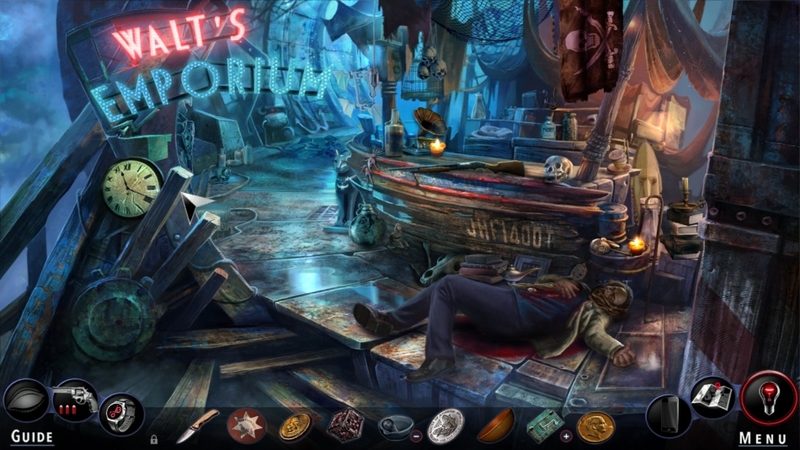 This entry was posted in CRIME & MYSTERY, JUD'S VIEWS & TROUBLESHOOTING, SPOOKY GAMES and tagged Adam Wolfe Series; Flames of Time; Blood of Eternity, Big Fish Games, crime; detectives; detection; mystery, Games; Reviews, Gorgeous Crime Real & Fantasy graphics, graphic content and is intended for mature audiences., Hidden Object Games, Jud, Mad Head World, Paranormal Crime Investigations, Point & Click, Unsatisfactory endings; Shut-down endings. Bookmark the permalink. I am in the midst of playing this right now. Quite enjoyable so far.